In a strange way, some of them are a little funny and even ironic, which lends a certain charm. 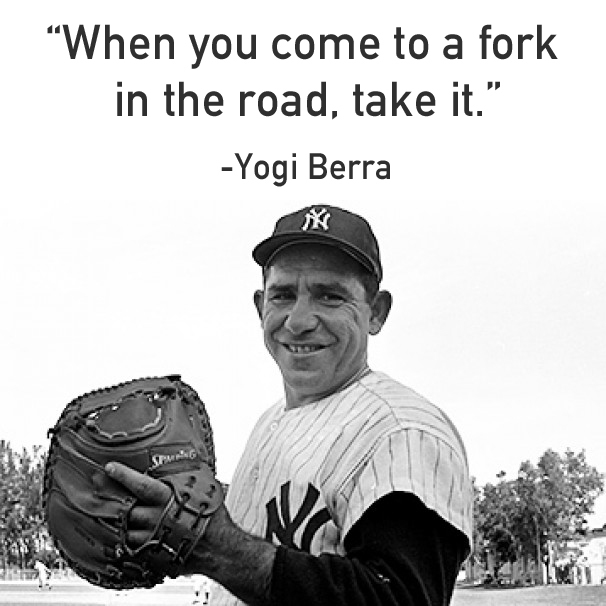 Let’s see if I can use these turns of phrase to describe my thoughts about a book, titled in a Yogi Berra quote. Is the title of a book written by Marlo Thomas, which showcases the midlife career changes of sixty women. They come from all walks of life, different backgrounds, success and challenges. There are no 2 stories which are the same, just like each person is completely different. I think for many women, they either miss the fork in the road entirely or they want certainty in their lives, so they don’t choose either path. They stay the same. I certainly felt the downwards pull to stay small, certain and keep everything easy. That was for as much for my security as it was for those around me. Even when my job changed or I was promoted, it was always within the same scope, same co-workers and customers. I was never pushed way outside my comfort zone, nor did I ask for that. Now I have so many forks in the road ahead of me, I have trouble choosing. So I don’t. I just go. I know I can always circle back and take a new path tomorrow or next week, whenever I am ready. I think this is frighteningly obvious but NOT common. People have a tendency to speak over others. Never taking the time to listen, first. Social media images and updates are all-consuming, so the importance is on the appearance of what we are doing, rather than the experience itself. We don’t notice anything, we record it. This is dangerously superficial ground. The examples we are setting are poor. Young people are not learning how to create (IRL: in-real-life) relationships which are deep and strong. Everything is fleeting. Once I decided to start watching myself, listening to what I was feeling, I began to manifest a new confidence. This soul-searching took some time. Quite frankly the process is ongoing. Each day, I require some time to reflect, contemplate and think for myself, without external boundaries and constraints. I have been guilty of thinking this way. On one hand, a mistake is lesson. A jumping off point to begin again. Try something else. But we often associate a negative value with a mistake. This can create destructive self talk as to the nature of our very character, or the kind of person we are. We didn’t make a mistake, we are a mistake. This is where shame lives, in this absolute way of thinking. We don’t give ourselves any wiggle room. Some of us learned this way of thinking from others or were forced to accept it along the way as our truth. It has to be unlearned. Another danger of this fabulous life we are spending so much time curating, are the comments. If you sit at a dinner table with anyone and look at them, in their eyes, nobody would say what they so easily write in digital form. There are very few exceptions where a letter, or written thought is better than a conversation. Getting the courage to have a difficult talk with someone is not easy. But we seem to spend too much time worrying about offhand remarks or comments, even from people we know and nowhere near enough time being the kind of decent human being we should be. It is this kind of worry which stops us dead in our tracks. We know what our friends and family might say about our desire to make a major change in our lives. Or we think we do. Often, the response is not at all what we thought it would be. Which proves the point, that a conversation (IRL) is tough. And we should not assume what other people are thinking. Once the ‘reinvention generation’ of women decided their course of action, they got down to it. They researched, learned everything they could, and set goals. The made plans, soliciting help from far and wide. Once they made up their minds to go for it, they couldn’t be stopped. They knew the direction they were going and the path they wanted to take. Of course, there were twists and turns along the way, but the direction was true. For me, reading the stories in the book, when the end is known and success was achieved, I need to be kind to myself. I am just starting out. While I have made a big first step and I have a good sense of direction, my story is not written yet. But, the inspiration I take from other women walking ahead of me is huge! There may be more Berra-isms which apply, but I like these six. Hope you enjoyed them. Tell me if any others come to mind for us midlife career changers! ← Oops…found a major budget mistake!